The annual peaking of the cherry blossoms in Washington DC brings thousands of visitors to the nation’s capital – as well as increased traffic and fewer parking spots. For years Reston Limousine has provided a stress-free solution to residents and visitors with chauffeured transportation to the Tidal Basin to enjoy the beauty of this springtime tradition. After recent weather swings, forecasters have ultimately predicted this year’s peak bloom period for March 19-22. National Cherry Blossom Festival organizers have planned a series of exciting events to celebrate, including the Pink Tie Party on March 16, Opening Ceremony on March 25, Blossom Kite Festival on April and more. 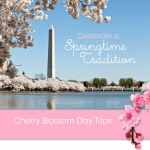 For more information about the events, visit www.nationalcherryblossomfestival.org. Sign up for our weekly eblasts for a chance to win 4 hours in a luxury sedan to take yourself and a loved one into The District and see the cherry blossoms!